Mike Greene - mgreene@shawmedia.com Zack, 6, and his 'Big Brother' Gene Lowery laugh while speaking with a Big Brothers Big Sisters case manager Thursday, April 19, 2012 in Crystal Lake. Big Brothers Big Sisters of McHenry County launched a campaign this month to recruit more big brothers for the organization. Mike Greene - mgreene@shawmedia.com Zack, 6, smiles during his first meeting with his 'Big Brother' Gene Lowery Thursday, April 19, 2012 in Crystal Lake. The pair made plans to go bowling and play catch together. 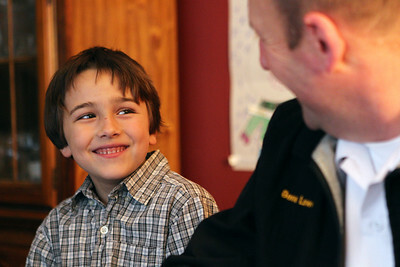 Mike Greene - mgreene@shawmedia.com Zack, 6, smiles while speaking with his 'Big Brother' Gene Lowery Thursday, April 19, 2012 in Crystal Lake. This was Zack's first time speaking with his 'Big Brother' and the pair made plans to go bowling and play catch together. 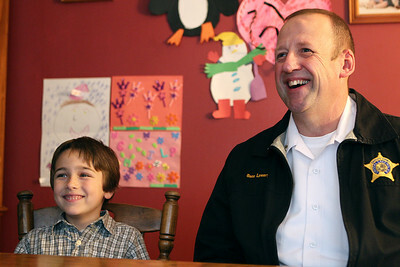 Zack, 6, smiles during his first meeting with his 'Big Brother' Gene Lowery Thursday, April 19, 2012 in Crystal Lake. The pair made plans to go bowling and play catch together.